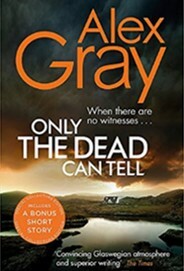 It is interesting that the word ‘tell’ features in the title of this 15th instalment of the William Lorimer Glasgow-set procedural series. There is a lot of ‘telling’ in this novel, which would have been much better if ‘shown’. This is to the detriment of an otherwise compelling and modern fable of life in 2018 Scotland. Unlikely but not impossible, the cops posit as they begin their quest to resolve the riddle. They first target of suspicion is Peter who manages the vehicle-rental company left to Dorothy by her parents. He is a drinker and a wife-beater who seemingly treated poor old Dorothy as if she were a punch-bag. The spouse is always the first suspect, Gray reminds us, but these cops are pros and do not wish to assume. Lorimer is surrounded by strong women, Rosie Fergusson and Kirsty Wilson among them. Good cops both, they do much of the legwork along the trail leading to the killer of Dorothy Guilford (this despite both being pregnant, Kirsty with her first child, Rosie with her second). From the start, Lorimer is juggling a human-trafficking case with the Guilford killing. It takes him little time to identify dots that might link the two. The modern slavery plot is a strong one, the police officers’ righteous indignation at the servitude and humiliation easy to relate to by readers. Gray astutely narrates part of that strand from the perspective a trafficked woman and a female cop determined to unshackle her and others. Placed on remand, Peter Guilford is beaten up in the jail’s shower area. As his life hangs in the balance, the cops scurry to pre-empt any further violence and get their man to sing as to who might have pummelled him. The action bounces along nicely from the hospital to the cop shop to the homes of other players in this sorry saga. Also colourful and believable are the nail bars, like many in the UK, legitimate covers for prostitution, trafficking and other nasty businesses. The tensest moments in the book are when we follow Serbian Juliana Ferenc, a trafficked woman racing against time to flee her earlier captors and their paymasters. Gray creates genuine empathy with the woman’s terror and concern for her safety. One of the more interesting characters is the morbidly obese Shirley Finnegan, sister to the late Dorothy who does not lament her one bit. The cops quickly figure that Shirley’s resentment of her younger sibling clings like blubber to the fat woman, whose parents favoured Dorothy emotionally and financially. The reader soon realises that Finnegan’s role in the murder or suicide, and possibly the slavery racket, is key. The police piece it together around their own personal lives, which includes two pregnancies, a children’s book and various professional dilemmas. It is all interesting and believable, as is the way the police put two and two together - establishing the current links to the right suspects. In the #MeToo age, the author deserves kudos for drawing attention to the vile, inhuman traffickers who treat women as commodities. The prose ultimately lets Gray down, however. Too much emotion and thinking is exposed rather than suggested, too many underlying questions are posed out loud. The author seems to forget that adding adjectives like terrible and brutal to nouns like tragedy and murder is not just superfluous, it is jarring. Such awkward bits side-lines the reader – this reader at least – on his or her journey through the meaner and the nicer streets of Glasgow.